We have paid for your parking. There is ample parking at North Beach in Ft. De Soto Park. We require that runners and walkers be properly prepared and trained to finish the Halfathon within 4 hours (18 minute/mile pace). Please note that 4 hours after the start, course support ((i.e. aid/water stations, volunteers, photographers, ambulance, course marshals, clocks, etc.) is not guaranteed. The 5k runners and walkers should be finished within the 4 hour time limit for the halfathon. 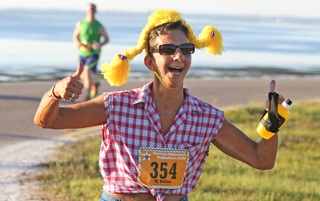 Both races are staged entirely in Fort De Soto Park, recognized as one of the best beaches in the nation. The course features a loop for the first 3.1 miles of the race, bringing athletes back through the start line. The rest of the course is an extremely flat, out-and-back tour of Fort De Soto Park, mostly on paved recreational trails. With a start time about 40 minutes before sunrise to avoid warm weather, the first portion of the race will take place in the dawn. Sunrise should be directly ahead of our athletes before the turn-around at East Beach. Check out our course map for the precise route. Create unique costumes in the spirit of this festive holiday, but ones that will not adversely affect your performance. Or simply wear mismatched uniforms. Or orange and black. See a list of our Costume Contest categories. Treats including food, beverage and live entertainment provided by local supporters.